Have some kids who love nothing more than putting on shows? Now, thanks to Carlsbadistan’s New Village Arts Theatre they can get some professional training even if they’re as young as 4 years old with Kids Act. Kids Act can help motivate, inspire and enrich your child. . . With 2 distinct age groups (4-6yrs & 7-11yrs) and class sizes small enough to tailor each child’s experience, Kids Act is a special way to ignite your student’s imagination. Session start on April 16, 2012. For more details, or to sign up click here. 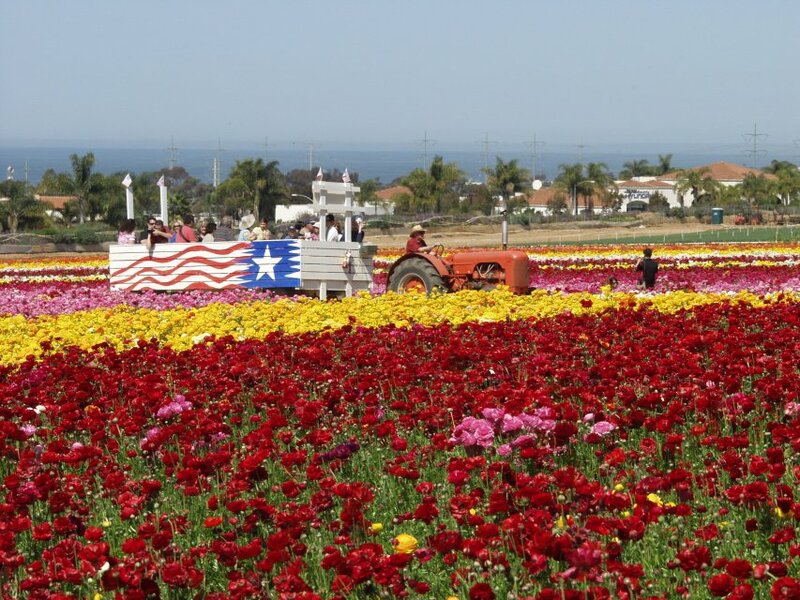 You know that hillside full of flowers (or dirt as it currently appears) located directly behind The Carlsbad Premium Outlets shopping mall? Well, as of today, March 1, 2011 they are open for wandering. And for fans of Ranunculus this could be heaven. Beginning Monday, July 19, 2010 the Carlsbad Stand-Up Paddleboard Club will be expanding their special stand-up paddle and kayak rentals for parents paddling with kids under 12. From 8 AM to 12 PM Monday through Thursday rentals will only be $10 an hour. 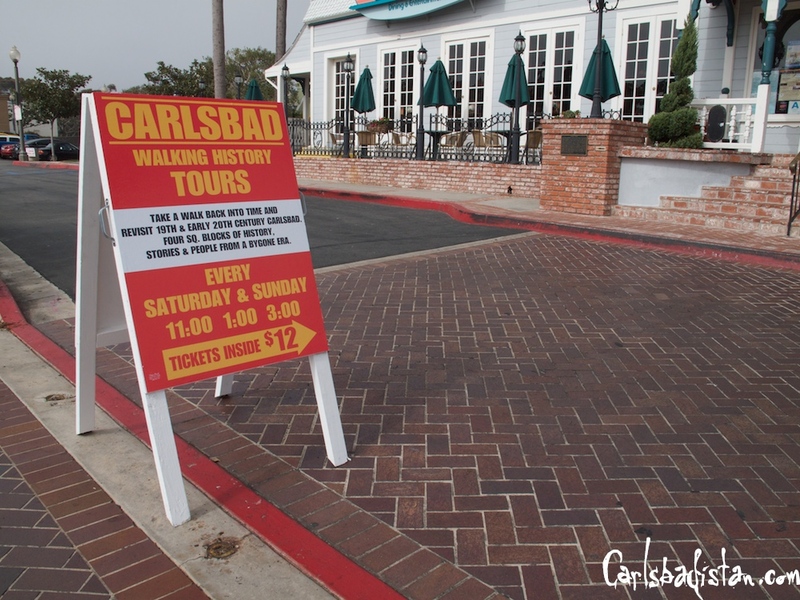 The Carlsbad Stand-Up Paddleboard Club is located at 4509 Adams St., in Carlsbad (not at California Water Sports near the freeway). For more information click the link. 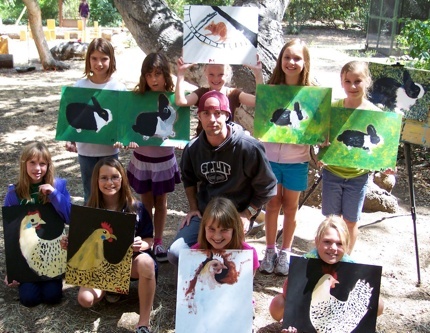 A crew of budding artists shows off their work after a week at the Carlsbad Art Farm, according to a post on the school’s blog. During the week, students learn to sketch animals; color mix using a limited pallet; how to block in their subject for a painting; a little about animal anatomy, and then use the colors they create on their own pallet to render their subject (in this case: a bunny, chickens and a mouse on a wheel). These students will be entering Grade 4 this fall. The Art Farm Summer Camps are open to students entering Grades 2-8 in the fall of 2010 and run either mornings or afternoons beginning each Monday. Sign up now as there is still spots open. For more information click the link. 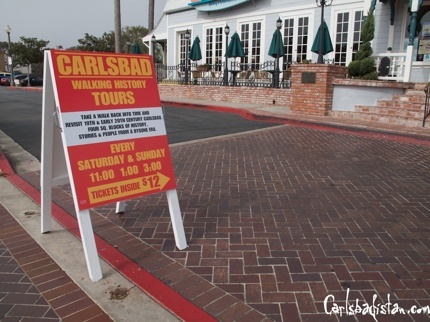 We know why The Forum Carlsbad has free horse-drawn carriage rides and it doesn’t bother us at all because we can visit a mall without buying anything and we often do. 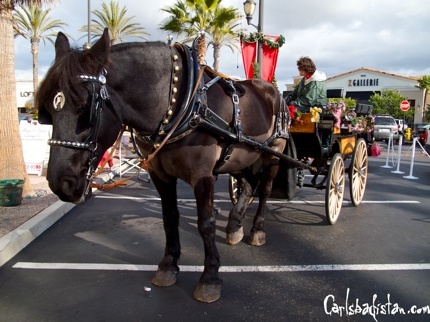 That said the Always and Forever Carriage Company will be offering free holiday carriage rides every Saturday and Sunday until Christmas at The Forum Carlsbad. And, yes, the ride is through a crowded shopping mall, but it’s still fun and most importantly it’s free. While you’re there stop in and see the most real Santa Claus we’ve seen. Real beard, real old, real Santa Claus. He’s sitting next to the Christmas tree by Lululemon (11 AM to 4 PM Saturdays and Sundays until Christmas). For the second week in a row we snuck up to the Carlsbad Sheraton for an epic view of the Legoland fireworks at 8:30 PM on Saturday night. From the lower parking lot we could see the fireworks from the ground to the sky and be so close we could almost feel them exploding overhead. 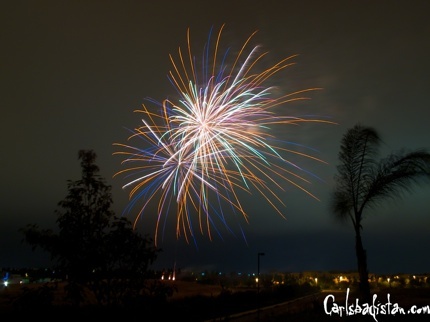 Definitely a great way to kick off an evening in Carlsbadistan, but next Saturday night August 29, 2009 at 8:30 PM is the last fireworks show for the summer. Don’t miss it. According to their website, Jon and Karen Whitehead started Carlsbadistan’s Captain Cooks Culinary Academy for Kids because they wanted to combine their “passions for cooking, healthy eating and the environment.” Captain Cooks offers three different cooking classes for kids 4-7, 7-13, and 11-16. IRON CHEF: Each day our young chefs will create 2-3 dishes out of a secret ingredient that will be introduced to them each day. They will learn valuable lessons such as how to work together as a team and how to be creative with what is in the fridge. Our chefs will guide them through the process of looking up recipes in cookbooks and using their imaginations to create tasty dishes. Ages 4-7, 7-13 and 11-16. BASICS OF BAKING: Young chefs will learn the basics of baking, from yeast breads to quick breads, pies and pastries, pizza dough and breadsticks, cookies and cakes. Ages 4-7, 7-13, and 11-16. There still are a few (like six) spots left in classes this summer. Click the link for more info. 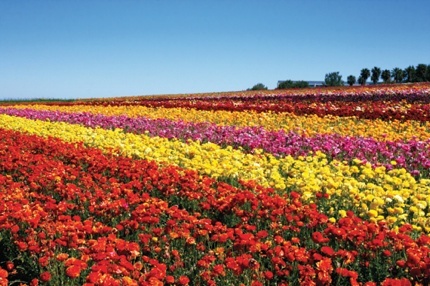 It’s hard to believe, but The Flower Fields are now open for their spring 2009 run. Carlsbadistan’s claim to I-5 roadside fame opened on March 1 and will remain open each day from 9 AM to 6 PM until May 10, 2009. Take yourself out of the ordinary and spend a few hours in one of nature’s wonders – our Fields of Dreams, our Fields of Color. 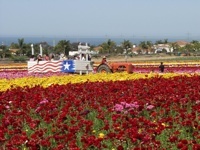 A place where kids can run and adults can linger – 50 acres of extraordinary color in bloom on a hillside overlooking the Pacific Ocean, with a special nursery, garden, and gift shop by Armstrong Garden Centers, and festivals throughout the season. Tickets are $10.00 for Adults, $9.00 for Seniors 60+, $5.00 for Children 3 – 10, Children 2 and under are free.